Since the very first days of the company back in 1954, our family has felt a duty and a passion to give back to the communities we serve. Whether it's sponsoring local soccer teams or providing gift cards for silent auctions, over the years we have donated many millions of dollars to charity to help make the lives of the people in our communities better. The vast majority of this giving was done silently and relatively anonymously until 1996, when my grandfather endowed the Helene and Joseph Sherwood Prize for Combating Hate (https://la.adl.org/programs/helene-and-joseph-sherwood-prize-for-combating-hate/), an award that recognizes those law enforcement professionals who are so committed to their work that they make a significant difference in their communities and serve as role models for their departments by going above and beyond the call of duty to protect the community from hatred and bigotry. Later, in 2010, at the request of some of the charities we had been deeply involved with, we began promoting their work as part of our general advertising. 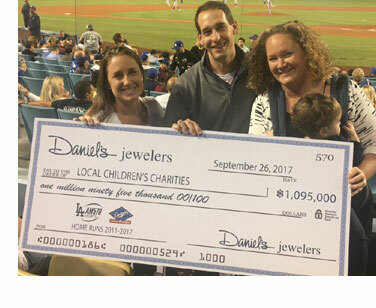 Since then, our family has donated $1000 for every Los Angeles Dodgers Homerun, San Diego Padres Homerun and Arizona Diamondbacks homerun, well over $1 Million dollars. Our commitment as a company and as a family is to support children's charities that make the lives of our employees, customers, and communities better. There is so much work to do and we are honored to be able do our part. As Margaret Mead so eloquently said, "never doubt that a small group of thoughtful, committed citizens can change the world; indeed, it's the only thing that ever has."